When left untreated, the swelling and redness in your mouth known as gingivitis can erupt into periodontal disease. Gum disease results in discomfort and loss of tooth support and teeth themselves. It is also linked to diabetes and diseases of the cardiovascular system. For pregnant women, gingivitis must be treated immediately, or else it may lead to premature birth or babies born underweight. Below, we explain the causes, symptoms, treatment, and prevention methods for pregnancy gingivitis. 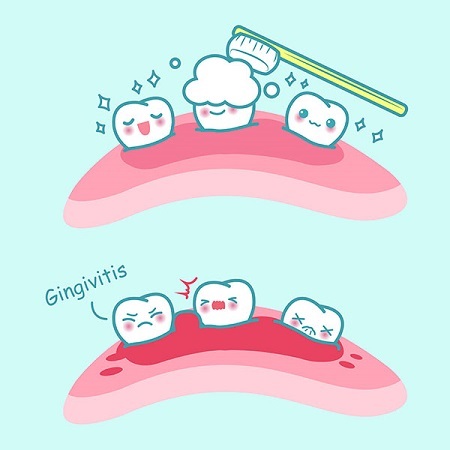 Gingivitis refers to the inflammation of the gums. Generally, this condition may signal or work as the onset of periodontitis. As a progression of gingivitis and its inflammation, periodontitis is characterized by the loss of the gum structure that holds teeth in place. The pregnancy version of gingivitis comes from the fact that it occurs during, and, as you will see below, results from pregnancy. Normally, expecting mothers may experience gingivitis between the second and eighth months of pregnancy. At the root of gingivitis, among the pregnant and non-pregnant alike, is an infection of the gum. Bacteria interacts with food particles, sugar, and other items left on an area of the teeth to form plaque. The accumulation and its intrusion into gum pockets or openings spur the tissue to fight the bacteria. With this battle comes inflammation of the gums. A hormone called progesterone can spur the growth of bacteria. In the reproductive realm, a woman’s endocrine system produces progesterone to accumulate on and prepare the uterus’ wall to receive and support an embryo. This process occurs usually in the second half of a woman’s menstrual cycle. If there is no conception and, thus, no pregnancy before the end of the cycle, the progesterone levels will drop. When a woman becomes pregnant, the body continues producing progesterone. With a greater supply of progesterone from pregnancy, the bacteria responsible for gingivitis has an easier time generating. Furthermore, progesterone can intensify the gum’s sensitivity to plaque and the reaction in the gums to bacteria. As with other forms of gingivitis, pregnancy gingivitis is marked by swollen, tender, receding, or red gums. Bleeding in the gums may occur when the pregnant person brushes or flosses teeth. Other pregnancy gingivitis symptoms include bad breath. If you notice any of these symptoms, promptly contact your dentist for examination, diagnosis, and treatment options. In a mouth free of gingivitis, the teeth should appear snugly fit around the gums. Firmness and a pale or pink color describe a healthy set of gums. Dentists treating pregnant women with gingivitis typically focus on combating the infection. Common antibiotics include amoxicillin, ampicillin, penicillin, clindamycin, erythromycin, and nitrofurantoin. Your dentist should know if you are pregnant before undertaking any treatment of gingivitis. For example, tetracycline is normally excluded from the prescribed treatments. This antibiotic can stain the teeth of the developing fetus and leave permanent gray or brown stains on the child’s teeth as the child grows after birth. Prescription or other dentist-recommended mouthwashes may also aid in treating gingivitis. The remedies include saline, to lessen gum irritation, and chlorhexidine. Should gingivitis during pregnancy progress into periodontal disease, scaling and root planing appear as safe alternatives in the second trimester of pregnancy. Scaling involves removal of plaque, bacteria, and the matter that breeds it from the infected area. Dentists smooth the roots that were scaled through root planing. Although these are regarded as non-threats to pregnant women, these procedures do not reverse the damage that periodontal disease might wreak upon the fetus. Brush your teeth at least twice a day, preferably in the mornings after breakfast and especially in the evening. Use fluoride toothpaste. A “soft” toothbrush lessens the chance of irritating the gums, which might already be sensitive due to the hormones generated in pregnancy. Don’t use fluoride supplements in place of brushing your teeth with fluoride paste. Spit, rather than rinse, after brushing. Drink tap water that contains fluoride. Floss daily, especially after the last meal of the day. Avoid or limit sugary drinks and foods, such as sodas, candy, and desserts. Sugar facilitates the breeding of bacteria that cause gingivitis and periodontal disease. Abstain from smoking or other tobacco use. Rinse your mouth with water or antimicrobial mouthwash. This may come in handy if you become sick from acid reflux, which can be common in pregnancy. Should you vomit, wait about half an hour after rising before brushing your teeth. The acid released during such an episode may soften or weaken the enamel. Regular dental visits have heightened importance during pregnancy, as your risk of gingivitis is already increased. Visit every six months for cleanings and examinations. As with gingivitis for the rest of the people, pregnant women should take heed of the symptoms to get treatment and prevent worse problems. Pregnant women are especially susceptible to gingivitis because of the hormones that operate and accumulate during pregnancy. While perhaps not a guarantee, proper diet and oral habits can at least reduce the risk of pregnancy gingivitis. Let us know if you have ever experienced this and what treatments have helped you. I never knew this was a symptom of pregnancy. I already have super sensitive gums (not pregnant) and have to use a prescription mouthwash to keep gum inflammation under control for me. Pregnancy gingivitis is not necessarily a symptom of pregnancy (not all pregnant women will experience it), but more a condition that can be triggered more easily by the greater supply of progesterone during pregnancy. Thank you for your comment!